What better way to honor our veterans and their sacrifices today than to take leadership in recognizing the origins of Veterans’ Day as a day of peace? The organization Veterans for Peace knows this. Committed to “building a culture of peace,” VFP recognizes this origin of Veterans’ Day each year by informing the public of “the true causes of war and the enormous costs of wars.” Today, Veterans for Peace, with over 140 chapters worldwide, will organize peace marches, Veterans’ Day parades, and commemorations. They will stage public readings of wartime letters and names of fallen soldiers, and hold exhibits and musical performances to honor and celebrate veterans. 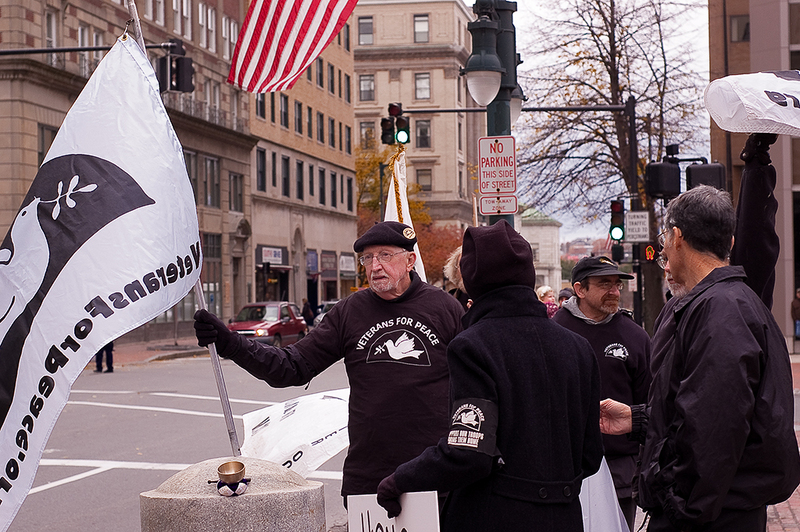 Massachusetts Veterans for Peace are encouraging congregations across the state to revive the tradition of ringing their bells at 11 AM on Veterans’ Day for the cause of peace. What about you? What can you do? How can you exercise leadership in taking a stand for peace in the midst of the many conflicts in today’s world? This Veterans’ Day might provide the opportunity for you to support diplomacy with Iran. Or perhaps your leading is to support humanitarian aid for Syrians caught in the middle of the fighting between government and rebel forces, or to advocate for the withdrawal of all troops from Afghanistan. Or perhaps you can join Veterans for Peace as one of their allies in your locale. On this Veterans’ Day, it behooves us to consider how we can honor our veterans and their sacrifices by reclaiming the holiday and taking a stand for peace. Let us join the efforts of those who understand the origins of the holiday and want to work for peace in this war-ravaged world.